Stay on top of the current kitchen design trends. The kitchen is usually the heart of every household where you get to enjoy food and socialize with family and friends. Since you spend many hours out of the week in the kitchen, it should be aesthetically pleasing and incorporate durable features. It is an area of the home that deserves special attention. Whether you are remodeling or building your kitchen from the ground up, you should stay on top of the current design trends for inspiration. Throughout the years quartz has gained popularity with homeowners because of its high durability and wide range of color options. Today, people are looking for kitchen materials that are long lasting and worth the initial investment. Quartz is scratch and burn resistant, so it is the perfect material for large families who love to cook. The natural stone is mixed with resins to produce countertops that are available in a variety of colors. You can bring your kitchen to life with a colorful quartz countertop. 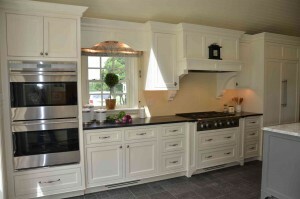 Nothing says simplicity and elegance like a kitchen with classic white cabinets and countertops. Monotone colors, white, grey, and back, are gaining popularity in kitchen designs across the country. The three colors work well with each other and can be integrated subtly through appliances and finishes. Grey is currently in demand in 2017 and can make any kitchen look sleek and sophisticated. Love it or hate it, technology is continuously evolving in different parts of our lives and the kitchen is no different. There are current advancements in appliances such as voice activated lights and stoves, that can make your life much easier. Integrating appliances like a touch activated sink can give your classic kitchen a modern twist. See what appliances your family would use and would help them on a daily basis. Rock Tops Fabrications uses the latest technology to ensure that your new kitchen is designed, cut, and finished exactly how you want it. We have over a decade of experience and have been constantly improving our services and offerings to meet the diverse needs of our customers. If you are in the Maryland, D.C., or Virginia area and looking for a beautiful new remodeled kitchen, give us a call at 410-363-4257. For more information and tips on making your home your own, follow us on social media at Twitter, Facebook, YouTube, Google+, Pinterest, and Houzz. This entry was posted on Friday, August 18th, 2017 at 2:47 pm. Both comments and pings are currently closed.